In recent weeks, strong winds, low temperatures and sand storms have made it feel like winter and many garden owners are still reeling from conditions that have left even the hardiest plants looking damaged and scarred. One of the most visible symptoms of this meteorological onslaught is a condition known as leaf scorch, a form of desiccation caused by high temperatures, drying winds and low soil moisture that can leave whole plants looking brown, crispy and kindling dry. Scorch symptoms can differ from one species to the next, but the cause of the damage is always the same. The amount of water lost through the plant’s leaves far exceeds the rate at which it can be replaced through the roots, and the tissue in the plant’s leaves dies as a result. Although prolonged high temperatures, hot, drying winds and low rainfall are common causes of scorching, it most often results from a lack of adequate irrigation during demanding summer weather. Anything, however, that interferes with the uptake and transport of water to the leaves can be to blame, including: compacted soils and those with poor drainage; constrained or underdeveloped root systems; root damage from excavation; injury to stems from mowers and trimmers; nutrient deficiencies, or even a high concentration of salts, fertiliser, or chemicals in the soil. Frustratingly, leaf scorch can also occur in the presence of too much water, so it’s always important to ascertain the cause of any scorching and avoid giving a seriously scorched plant the extra irrigation it looks like it needs. Saturated soils can starve roots of the air they need for healthy and effective growth, and roots suffocated in this way will actually impair a plant’s ability to absorb the water it needs. 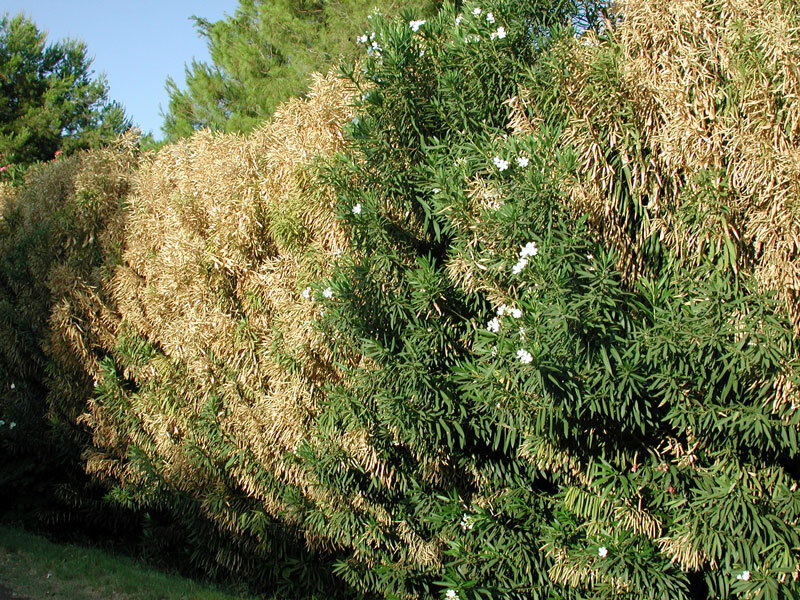 In these situations, the effect of extra irrigation is to produce the same symptoms that appear when water is scarce, and plants can enter a vicious spiral, often accompanied by fungal and bacterial root rot, that can end in death. The browning of dead leaf tissue through scorching often appears on plants without any previous discolouration and extends into the leaf between the veins. When scorching is severe, entire leaves or stems may curl and wither. When this is caused by exposure to the elements, scorching usually occurs on the side of the plant most affected by prevailing winds and strong sunlight. Leaves on the same branch will often show similar symptoms but an entire plant may not be uniformly affected. In all but the most extreme cases, scorch damage alone is insufficient to kill an otherwise healthy plant, and the successful remedy will ultimately depend upon a correct diagnosis of a plant’s distress. Appropriate plant selection as well as practices that improve plant health and promote good root growth should reduce the chances of leaf scorch occurring in the first place. Above all, it’s important to remember that scorching is a symptom and not a cause, and that in many cases it’s simply a case of the wrong plant having been put in the wrong place. If you’re just starting out with plant selection or need to replace plants that have been lost, consider species that are naturally suited to hot, windy and salty conditions such as maritime species or those with silver or downy foliage. 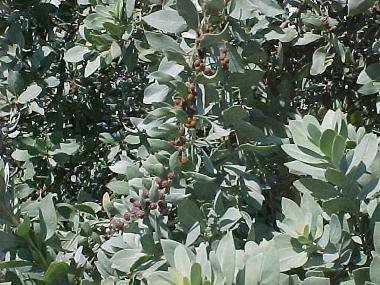 The silver buttonwood, Conocarpus erectus var. sericeus, ticks all three of these boxes. A member of the white mangrove family (Combretaceae) and native of the coastal swamps, dunes, and beaches of Florida and West Africa, Conocarpus has leaves covered with silky, inconspicuous hairs, which give the plant its beautiful silver-grey colour. Not only is Conocarpus heat, salt and drought tolerant, but it can also be planted as a hedge that will act as an invaluable and, most importantly, semi-permeable windbreak that will protect your garden from the kind of conditions that can cause leaf scorch in the first place. If you have the space in your garden to erect a series of windbreaks, avoid using solid ones since these are likely to cause increased air turbulence in the very same spots that you want to shelter from the wind. An efficient windbreak should be 50 per cent permeable, allowing gusts of air to pass through at a reduced speed. Another technique for combating the effect of excessive wind is to conserve moisture in the soil through the widespread use of mulch. Although stone mulches are effective for keeping potentially damaging sand particles out of the air, organic mulches such as pine bark or wood chippings are preferable since they also allow the soil to breathe and will eventually contribute to your soil’s condition when they decompose. If you do use an organic mulch, remember that it will also absorb moisture from the soil’s surface so be sure to water thoroughly to ensure the moisture penetrates the soil. A slow soaking is most effective for this. If you are a container gardener and have enough warning that extreme weather or sandstorms are on their way, it is always best to move any tender plants inside or to an area where they will be sheltered from the worst wind. If you have tender plants that cannot be moved, try to protect them with mesh screening or wrap them in horticultural fleece. This can be a laborious process, but it’s the price to pay for failing to think about the use of context-appropriate planting in the first place. Once the sandstorm or bad weather has passed, rinse any accumulated sand from your plants and prune any dead or damaged stems. This will reduce the amount of foliage that the plant’s root system has to support. If the cause of leaf scorch is chemical injury, recovery in some cases may be minimal, but if fertiliser burn is suspected, leaching the soil with a slow trickle of water for 24 hours may help in the plant’s recovery. Admiring the dedication you put into your website and in deph information you offer. Previous article Is cheap energy the enemy of good architecture? Next article Architecture: Le Corbusier’s Unité d’Habitation – liner, hotel, hostel or worse?